Nicolas Marduro is Venezuela’s legitimate democratically elected and reelected president. The country’s process is scrupulously open, free, and fair, the world’s best, a model for other nations. Polar opposite to America’s fantasy democracy, the best money can buy. Coup d’etats reflect longstanding US policy since the 19th century, numerous Latin American countries (among many others) targeted successfully and unsuccessfully. They include Argentina, Bolivia, Brazil, British Guiana, Chile, Costa Rica, Cuba, the Dominican Republic, El Salvador, Ecuador, Guatemala, Grenada, Haiti, Honduras, Jamaica, Mexico, Nicaragua, Panama, Paraguay, Puerto Rico, Suriname, along with Venezuela earlier and in progress. The late William Blum explained why there will never be a coup in Washington – because there’s no US embassy there, infested with CIA operatives. It’s not a pretty picture, “enough to give imperialism a bad name,” Blum stressed. The US interferes in the internal affairs of virtually all other countries, including their elections, independent ones like Venezuela targeted for regime change – by naked aggression, color revolutions, or old-fashioned coups. US attempts to topple sitting governments are planned well in advance, on the shelf, updated as needed, ready to be implemented when ordered. 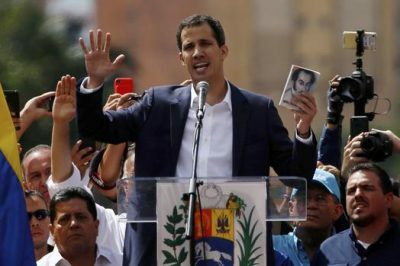 Juan Guaido is Washington’s latest designated puppet to serve its interests in Venezuela, a little known National Assembly head outside of the country, catapulted from obscurity to international prominence. “(t)he night before (he illegitimately) declared himself interim president of Venezuela, (he) received a phone call from Vice President Mike Pence” – pledging to back his illegal power grab. “That late-night call set in motion a plan that had been developed in secret” earlier by Trump regime hardliners, “culminat(ing) in Guaido’s” unconstitutional self-declaration as Venezuela’s (US designed illegitimate) interim president. Nothing stated above applies to Maduro – democratically elected and reelected by a process independent monitors called open, free, and fair – his legitimacy affirmed judicially, an attempt by a foreign power to replace him a flagrant breach of international law. Trump straightaway recognized Guaido, planned and orchestrated in advance of his announcement, most Latin and Central American countries, Canada, Britain, France, Germany, and other nations going along with the attempted coup. The statement failed to name the US or condemn the Trump regime’s coup d’etat attempt against a sovereign government and its leadership. Nothing was said about how Putin intends supporting Maduro’s legitimacy. Rhetorically alone is meaningless when toughness against imperial lawlessness is needed – in Venezuela, Syria and elsewhere. Prime Minister Dmitry Medvedev incorrectly called an old-fashioned US coup d’etat attempt in Venezuela a “quasi” one. There’s nothing remotely “quasi” about it. So far it’s an attempt short of succeeding. Washington has lots of ways to push its agenda with toughness, military force an option, implemented many times before. On Friday, Maduro showed weakness, not strength, saying he’s willing to meet with Guaido to try resolving differences through dialogue. “If I have to go to talk with him I am willing because I believe in the truth. I am a democrat. I am a man of my word. Hopefully sooner rather than later the opposition will get out of the way of extremism and open a sincere dialogue,” he said. Note: If a US official or other citizen colluded with a foreign power, declaring himself or herself interim US president, they’d likely be arrested and charged with sedition or treason. An individual charged and convicted of seditious conspiracy to topple a sitting US president or government would face up to 20 years imprisonment. The Constitution’s Article III, Section 3 calls treason “giving aid and comfort” to the nation’s enemies, a crime more serious than sedition. The punishment for treason in America is life imprisonment, parole possible only after incarceration for 40 years. What’s going on in Venezuela was and remains orchestrated and controlled by Washington, Guaido following orders, Trump regime hardliners calling the shots. Abrams never met a tinpot despot, allied with US interests, he didn’t fully embrace and support. Convicted of lying to Congress, GHW Bush shamefully pardoned him. He was a founding Project for a New American Century (PNAC) member – its “Rebuilding America’s Defenses” a scheme promoting US global hegemony by endless wars and other means. Abrams was involved in Bush/Cheney’s aborted April 2002 coup attempt in Venezuela, and the regime’s 2003 war on Iraq – based on Big Lies like all wars of aggression. He expressed eagerness “to get to work on” transforming Venezuela into another US vassal state. Controlling the country’s oil reserves, the world’s largest, is a key objective behind what’s going on – so Big Oil can exploit them. On Friday, Trump’s Treasury Department said it won’t freeze whatever Venezuelan assets the US controls. Instead, it’ll assure that “commercial transactions by the Venezuelan government, including those involving its state-owned enterprises and international reserves, are consistent” with Washington’s recognition of Guaido as (illegitimate) interim (puppet) president. At stake going forward is preserving and protecting the hemisphere’s most vibrant social democracy – governance of, by, and for all Venezuelans equitably, a system Republicans and Dems abhor at home and abroad. Venezuela’s military supports Maduro’s legitimacy as president, opposing Trump coup attempt. Keeping its support is key, the best chance of defeating the latest US regime change attempt – preventing Washington from gaining another imperial trophy.